Taiwan's VIA Technologies holds an x86 development license but seems to have been rather quiet for a number of years in this respect. The last thing HEXUS published regarding VIA x86 processors was back in the summer of 2014 when it announced a new version of its 2008 vintage Isaiah x86 compatible processor was about to be released. That was an initiative meant to combat Intel Atom Bay Trail and/or AMD Kabini processors in the low-power entry level netbook/tablet territory. Behind the scenes VIA has been working in partnership with a Shanghai Municipal Government founded fab-less semiconductor company by the name of Zhaoxin since 2013. The pair have worked through x86 three architecture updates (ZX-A, ZX-B, and ZX-C) together and have just recently released their first ZX-D processors, the KX-5000 family. Above you can see a rather unclear photo shared by PC Games Hardware (German), however it is clear enough to make out the important details. 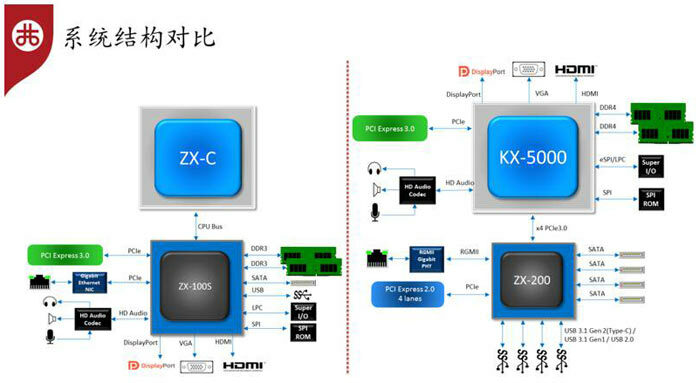 The KX-5000 'Wudaokou' offers either 4 or 8 cores (no multi-threading) which are 64-bit capable, running at up to 2GHz. The chips are manufactured on the 28nm process by TSMC. As for the platform, it supports DDR4, up to PCI-E 3.0, USB 3.1 Gen 2, and SATA3. Lenovo is one of the Chinese OEMs that has made use of the KX-5000 SoC in pre-built systems recently. Neck and neck with AMD by 2019? Coming up on the roadmap, likely this year, you can see that VIA and Zhaoxin will be tweaking the 'Wudaokou' to become the KX-6000 'Lujiazui'. This upgrade involves a process change to 16nm at TSMC and will help boost the processor clocks towards 3GHz. Later on the roadmap shows KX-7000 will deliver PCI-E 4.0 and DDR5 among its headline enhancements. 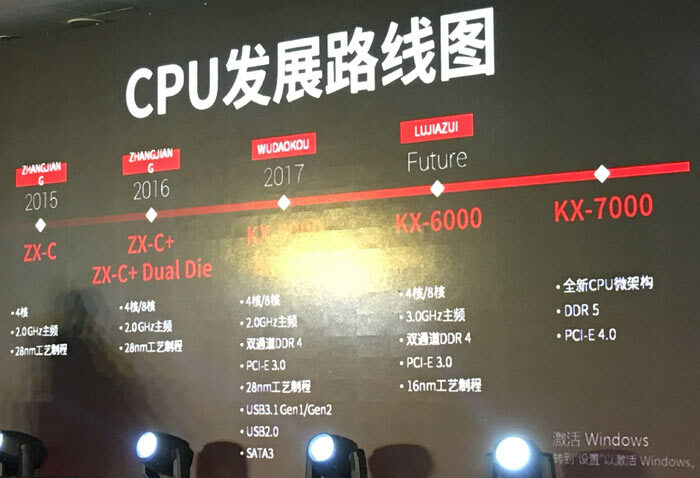 According to the presentation that accompanied the slide, and reported by PCHW.de, the VIA/Zhaoxin processors will reach a level of performance competitive to contemporary AMD Ryzen processors by 2019 (probably Zen 2). Past reports of ZX-D processor performance show steady progress in select benchmarks. Used to have some VIA chipsets back in the day. Certainly were highly rated so I was disappointed when they left and went a different route. I've only experienced their CPU's in some till hardware. And pretty good for what they were designed for. Good to see some more competition, it's been one sided for too long. But it is good seeing VIA chips back in competition. More competition in the CPU sector is good news. Having someone nipping at AMDs heels while they nip at Intels is only good for ys as a consumer!! It'll make a change from American spying firmware in our cpus. WOW!! Long live X86 Architecture! Used a Via Samuel II @733mhz back in the days, it lacked L2 cache but managed to offer descent performance. This will be good, more competition less prices for us.